Photo courtesy of Sun-N-Fun Lagoon. Sun-N-Fun Lagoon is a million gallons of waterslides, lazy rivers, falls, pools, tadpole features, lap lanes and diveboards, a bit of something for everyone. Photo courtesy of Sun-N-Fun Lagoon. A single mom, Katie Bonner is always on the hunt for weekend activities with her 7-year-old son Anthony. The family from Fort Myers has been to all the waterparks in South Florida, she says, but had recently discovered Sun-N-Fun Lagoon in Naples. The waterpark, a facility owned and operated by the Collier County Parks and Recreation Department, provides a respite from the unpredictable ocean tides with attractions geared to every age. After closing for winter, the waterpark opened its gates again for weekends starting in February, open seven days a week June through August. County officials promise the park will feel fresher, thanks to some important if not extravagant refurbishments done in the off-season. 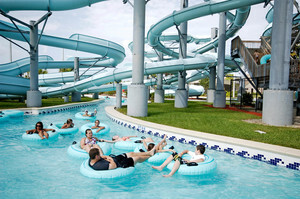 Visitors may not see enormous differences when they turn to the waterslides―besides the deeper shade of blue that came with replacing or maintaining much of the tubing this winter―but they will certainly feel the improvement stepping foot in Sunny’s River attraction, the 1,250-feet dual-path lazy river attraction. New tiling and a repaved floor surface should leave fewer park-goers checking for scrapes. 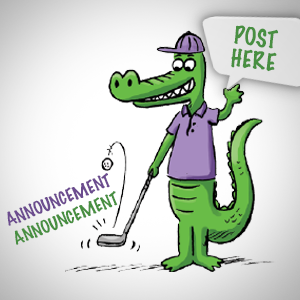 “It should be more comfortable on our patron’s feet,” says Richard DeGalan, aquatic supervisor for the Collier County Parks and Recreation Department. Sun-N-Fun Lagoon holds five single-rider water slides, each four stories high and running 220 to 350 feet. The most popular, the Sea Lion, plummets directly into the lazy river. For younger guests not yet 48-inches tall, there’s the Turtle Cove water playground attraction, open to kids ages 5 through 12. For the swim-diaper set, there’s the Tadpole Pool, 18 inches deep at its lowest spot with an age-appropriate waterslide. Waddell notes Sun-N-Fun Lagoon sits next to public fields and is adjacent to the Golisano Children’s Museum of Naples, so the park can complete a day spent outdoors. Officials expect some 600 children to enroll in swim lessons this summer at the park, and those seeking lifeguard certifications can also be trained there. Senior water aerobics classes and other programs are also will be offered, turning a tourist attraction into a public amenity as well. About 100,000 guests passed through the Sun-N-Fun Lagoon ticket booths last year, though DeGalan notes another 20,000 or so came for private party or evening events. And while tourists make up most of the folks in the water during summertime, residents through September will be able to enjoy the park on weekends. The venue also opens for a week during the Christmas season. The park boasts a low entry cost, as well―$6 for guests shorter than 48 inches, $13 otherwise. Those of us 60 and up pay $9; children age 3 and younger are free. 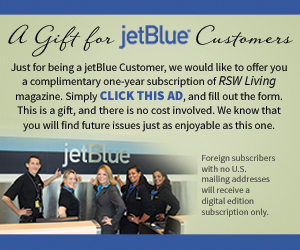 There is also $2 discount for Collier County residents. 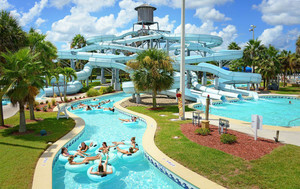 Sun-N-Fun Lagoon holds five single-rider water slides, each four stories high and running 220 to 350 feet. Photo courtesy of Sun-N-Fun Lagoon. Katie Bonner will certainly return, testifying that Sun-N-Fun Lagoon provides a respite from mega-attractions in Miami and Orlando. “It is not a very large park, which I find convenient,” she says. “You can sit in a comfy shaded seat and be able to keep an eye on your kids. Written by Jacob Ogles, a professional journalist living in Southwest Florida.